Happy Birthday, Ellen and Laren! 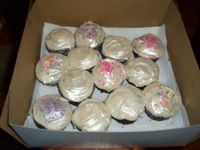 Anyway, they turned out just delicious, and really pretty too, as I tried my hand at decorating with silver dust (look for the shimmer on the frosting). I love this picture of Ellen, because it belies her supposed anti-cupcake stance. 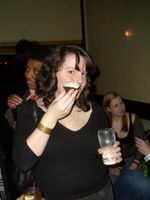 See, nobody can resist a good cupcake! For the record -- these were some very tasty cupcakes! Thanks Ms. A! Ooh, silver dust, must try.